Tsodilo Hills, in the Northern region of Botswana is a magical place. My association with the talented artist Oza Boo and the wonderful San ladies and men that make the earrings and necklaces for sale at Ndalama African Desert Crafts evolved from my visits to the hills. 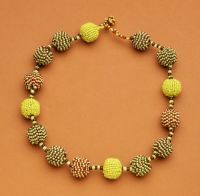 I have long admired and collected necklaces, bow, quiver and arrow sets and other skillfully crafted items from Tsodilo. I find the detail on the carved mokolwani nut necklaces extraordinary. At some point in time, I found a source for local farm-grown ostrich egg shells and decided to find a San artisan who could decorate them for me. My search, which took the better part of two years lead me to Oza Boo and his family. Oza's work depicts the nomadic life of the hunting San Bushman and the animals which are an integral part of his world. As my familiarity with the Tsodilo San grew, Xishe Boo emerged as a particularly gifted wood carver and Tsetsana Xixie became the ring-leader of the ladies, helping to bridge the language gap between English, Setswana and the click language of her family. The Tsodilo Hills, a sacred place to the indigenous people of the area which include the San Bushman and the Hambukushu, rise above the vast Kalahari Desert in the northern region of Botswana. Listed as a World Heritage Site in 2001, the hills are both spiritual and historical. Human activities that span over 100,000 years are recorded in the area. 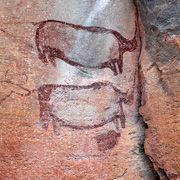 At least 4,500 paintings dating from between 850 and 1,100 AD grace the towering hills.Oza Boo and people live at the foot of Tsodilo Hills. His band has become sedentary and no longer lives in the completely nomadic tradition of their forefathers, yet they do not raise livestock or tend crops. Your purchase of San jewelry helps to keep the making of traditional San crafts alive and to provide Oza and his contemporaries with a welcome source of income.